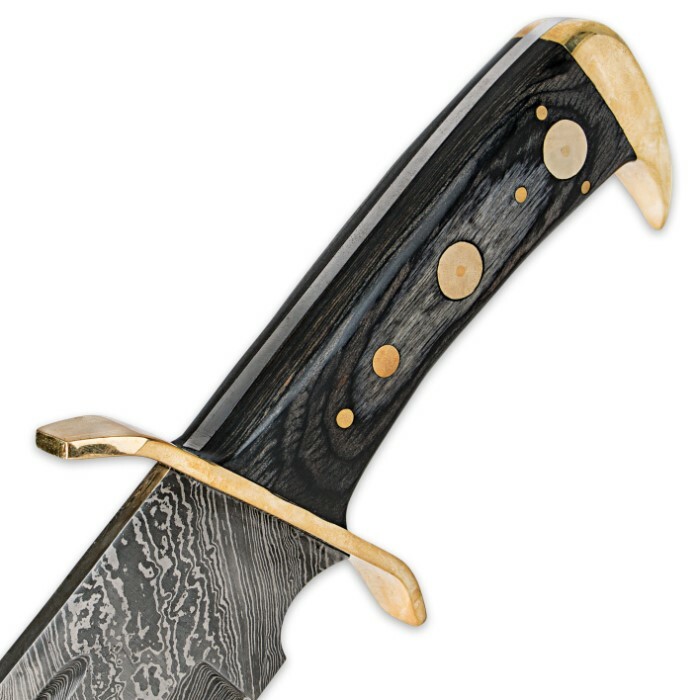 Timber Rattler Western Outlaw Damascus Bowie Knife | BUDK.com - Knives & Swords At The Lowest Prices! 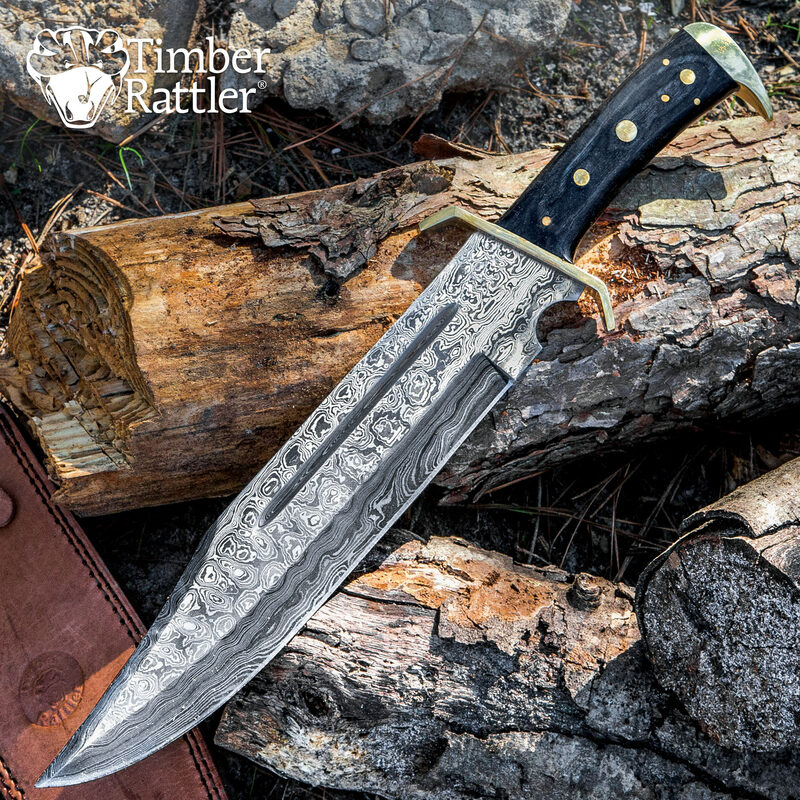 This Timber Rattler Outlaw Damascus Bowie knife is one powerful, full tang beast of a blade that every manly man needs. The stunningly patterned 11 3/8" Damascus steel blade will hack through anything life throws at you. Whether you're chopping trees or slicing through thick ropes, you'll get the job done fast with the Outlaw. The characteristic waves and whirls of the Damascus steel ensure that whatever you use it for, the Outlaw will look good doing it. 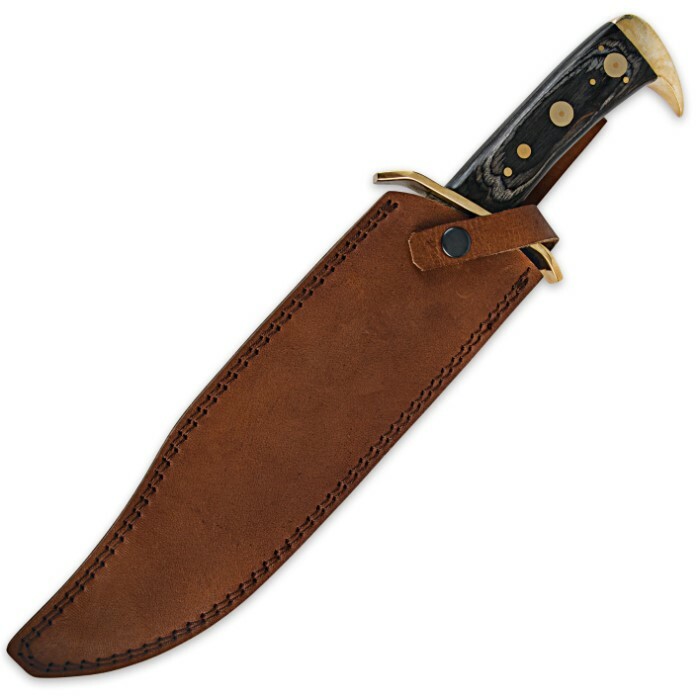 Each knife includes a handsome genuine leather belt sheath. The instant classic Timber Rattler Western Outlaw Damascus Bowie Knife could easily sell for hundreds of dollars, and at this incredibly low price, you'd better hurry before they're all gone! Great Knife, The Damascus steel is beautiful, when it came I wasn’t expecting it to be razor sharp out of the box. This is one beautiful monster of a knife. The knife is extremely well made, it has such a solid feel and weight. Can’t wait until I take this bad boy hunting. I also purchase it’s brother, same knife except it’s polished steel. Timber Rattler Western Outlaw Bowie Damascus is an awesome buy. I just saw a very similar knife in Damascus steel and they wanted $ 429.99 in my Gun Store, right then and there I was very happy I picked up this knife from BUDK, and now I have it’s brother as well. Can’t go wrong with knife. I bought this knife for a friend because of how nice it looked in the pictures. The pictures do not do it justice!! Excellent in every category and the look on his face was priceless. The size plus the beauty make this an unbeatable combo. If you have the coin, this is worth every penny and then some. Nice tight fit in excellent leather sheath. Blade is beautiful damascus, but blade was not sharp. Little work got sharp, will see how it holds edge. 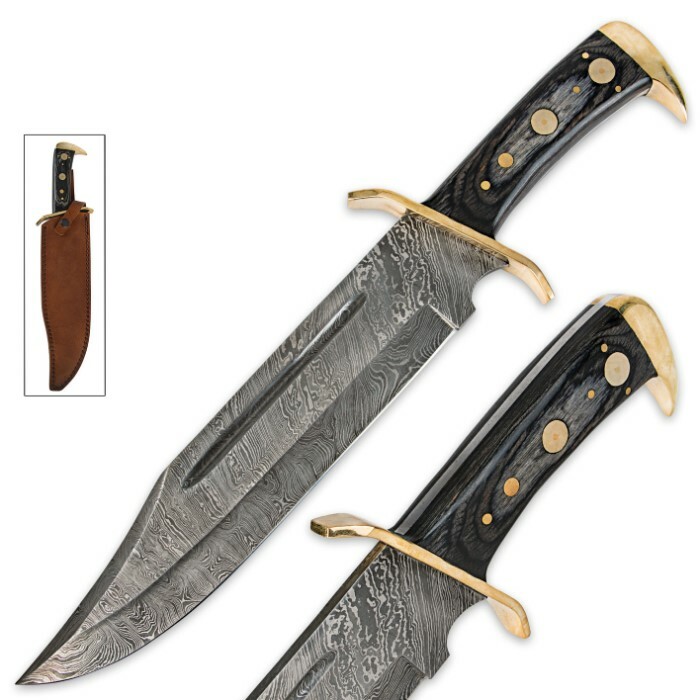 Great value for huge knife with nice damascus steel. Just got my Timer Rattler Damascus Bowie in. WHAT A KNIFE. It came well oiled and razor sharp. The handle is sturdy with no defects and the brass has some polish imperfections but who cares. Can't wait to put it to work. Mine came with a loose guard and chip in the scales. The blade is slightly warped making is difficult to chop branches with a diameter over an inch wide. Just got this knife today as a birthday gift and good god. This thing is HEFTY. The guard is less than perfect, and there's some sort of flaw in the brass itself, but i want a knife that works, not for display. And this beauty cut paper out of the box. GET YOU ONE. In my travels, I need a knife that intimidates the instant the blade clears the sheath... this beast exceeds this demand and then some! Heavy, but not too, with enough power to halt a runaway freight train! Can't carry a sword... but this'll do. Just got mine today and I have to say, for the closeout price it was definitely worth it. Very well made Bowie. Not disappointed one bit!